Remodeling a home can take as much work, if not more, than designing and building one from scratch. To be done properly, the home renovation must take the original structure and meld new ideas and materials with it to create a cohesive design. The Lakefront Splendor home renovation is an excellent example of taking an uninspiring original design and creating a luxurious and contemporary new space. This home began its life as a monochromatic box in the 1980s. To revitalize the structure, Kirkland architecture company Gelotte Hommas Drivdahl added new materials for texture and color. 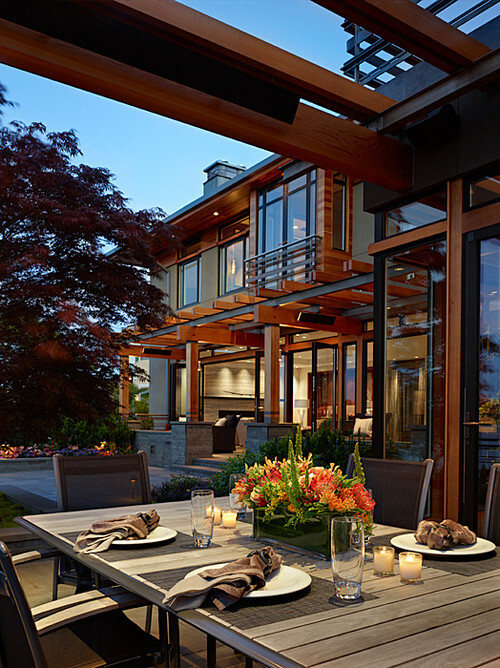 Rich wood paneling gives the home a warmer and more inviting feeling while pergolas above the patios add interest and change the shape of the home. Adding more color to the home was an important element of the remodel but it had to be the right color. 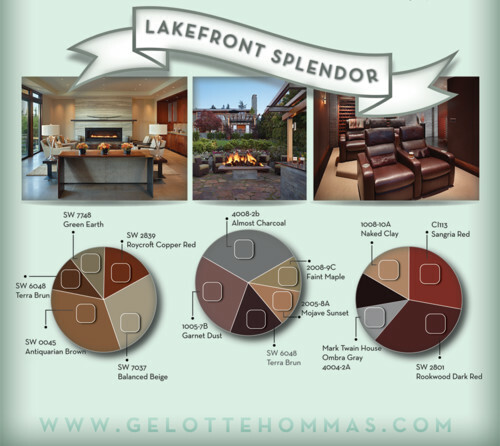 The graphic above shows the color palettes used for three different areas of the home. Even though they have distinct color palettes the overall tone is the same and there are no jarring differences in color when transitioning from one space to another. As mentioned previously, details were very important for this project. Here you can see a section of stairs and railing. This style of open floating stairs were popular when the home was built. 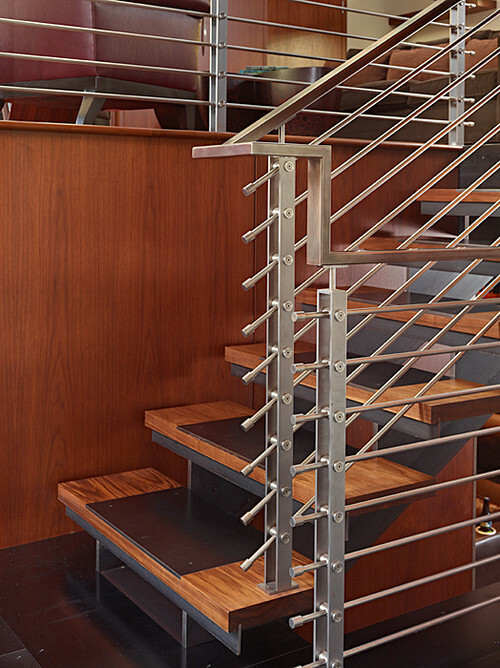 Our Kirkland architecture company redesigned the elegant wood of the step and industrial metal of the railing to create a decidedly contemporary look. A home renovation has its constraints, but a creative architect can see the potential in the bones and design an exquisite new home. As residential architects we design homes that reflect the lives of the people who drink their morning coffee at the counter and who curl up next to the fireplace on rainy days. We tell their stories through light, space, an that perfect gesture that makes a house a home. Every brick, every shingle, every color converges to compose a single story. The entirety of our residential design process-from the first evaluation of the land to the final selection of the cabinet hardware-centers on dialog with our clients. Each step is service and each choice , artistry. Each home is a new and fascinating story, ready to inspire us anew. This is the art of architecture.